Photograph depicts large dry rock storage building in foreground on left, mill in background, dryer building in right midground. Miscellaneous supplies in far right foreground, mountains visible in background. Handwritten annotation on verso of photograph: "Sept 1954". 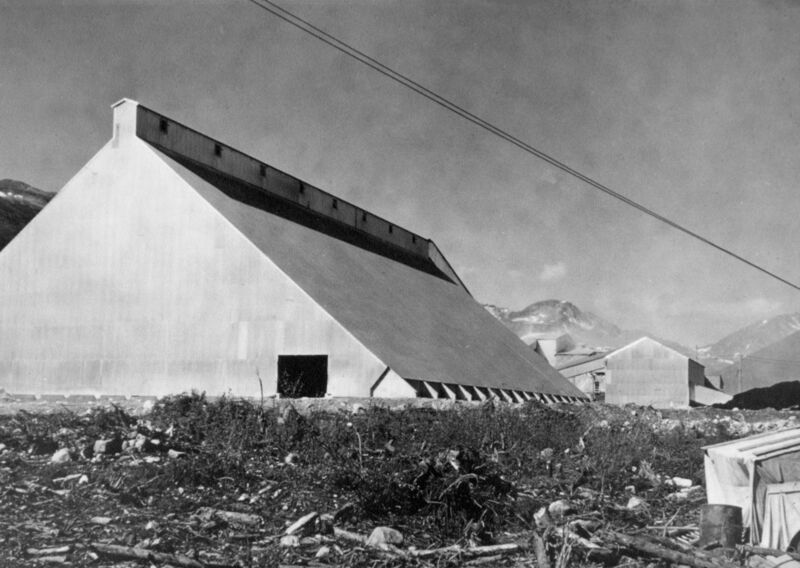 This photograph was originally stored inside duotang labeled "CASSIAR ASBESTOS CORPORATION LIMITED PHOTOGRAPHS 1954"; photo caption beneath this image: "40,000 Ton Dry Storage Building / Mill / Dryer Building". Item is part of the Cassiar Asbestos Corporation Ltd. fonds. Image is one of six photographs believed to have been taken together in 1954, see also items 2000.1.1.3.13.6, 2000.1.1.3.14.8, 2000.1.1.3.15.2, 2000.1.1.3.15.3, and 2000.1.1.3.24.2. These photos have been reprinted as negatives are in fragile condition. Copy print available. Original accession no. : 2000.1.1152.008 [this photograph came from box 1152].